When it comes to cleaning restrooms, building service contractors, their employees and building occupants will agree: it’s best for workers to get in and out as quickly as possible without forgetting attention to quality. Restroom cleaning, at its most basic, has not changed much as a process in many years. Innovations in other areas, however — such as chemicals, equipment and fixtures — have created efficiencies that can move a janitor through the task, stressing productivity to save time. Many factors may influence a BSC’s decision about how a restroom should be cleaned, including the number of janitorial workers available for a job, the size of a facility, the number of restrooms within that facility and occupant preference. At A&S Total Cleaning in Deerfield Beach, Fla., Operations Manager Christian Fils-Aime trains employees to use a process similar to that which he learned 30 years ago when he first started in the business. His employees eliminate debris and bacteria starting with dry work, then move toward wet tasks. “I was taught that when you clean a restroom, the first thing is to check all your dispensers, all the consumables: the toilet paper, hand towels, seat covers, soap dispenser, then also in the female restroom you have the female sanitary disposal boxes, and you empty those,” he says, pointing out that employees should be wearing protective latex gloves. After that, dry work is continued with trash pickup, and dispensers are filled. It’s easy for an employee to forget to fill dispensers at the same time that they are cleaning, Fils-Aime says. The next step is to wipe horizontal surfaces, including the tops of modular partitions, mirrors and dispensers, to transfer dust and debris to the floor, where it will then be swept up, then dust-mopped. Then comes polishing of mirrors, the sanitizing of sinks and countertops and polishing of any chrome work such as faucets. Toilets and urinals are disinfected, dried and polished on the outsides, as well as cleaned with bowl cleaner and a brush on the inside. Lastly, workers should sweep, place wet floor signs and then mop with disinfectant. Larry Faust, owner of CleanWay Maintenance Services in Brownsburg, Ind., teaches his employees to clean restrooms in a slightly different way, starting with a focus on chemical dwell time. “They do the toilet bowls and urinals, pouring the chemicals and letting them sit in there,” Faust says. While giving the disinfectant its proper dwell time, workers check and replenish supplies such as soap, tissue and towels, then clean fixtures and mirrors before going back to clean the toilets and urinals. Next is removing trash, and finally, sweeping and mopping the floors. Some BSCs, including Faust, view restroom cleaning as a loose science; as long as the job gets done, workers are allowed a bit of leeway as far as shortcuts that don’t compromise the quality of the work. “I started back in 1978, first I worked for a commercial contractor that cleaned office buildings primarily and I was trained on a procedure that they had and I’ve never done it any other way,” Faust says. However, Faust recently added a no-touch surface cleaner to his company’s arsenal. The system cleans restrooms in a third of the time, he says, and employees are happier to use it than they are to clean the traditional way. With pre-measured chemicals and an immediate water supply, Faust says it’s safer for employees as well. Harry Brooks, president of Cleaning Services of Tulsa in Tulsa, Okla., runs a smaller janitorial company, and has a very basic procedure taught to employees. Start with the light stuff, and from the top down. Now that more all-purpose cleaners are on the market, the number of chemicals a janitor carries into a restroom has been reduced, increasing efficiency. For Brooks, a general acid-based disinfectant and a glass cleaner are all his employees need to do a good cleaning job, he says. Then, depending on the site, workers periodically use a stronger, acid-based bowl cleaner. 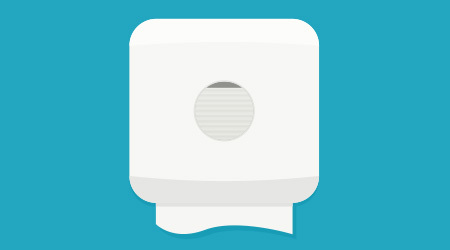 If customers have touchless fixtures such as automatic towel and soap dispensers installed, it also saves a bit of time for janitors, as they typically use less product and therefore are refilled less often. The trend toward day cleaning, or cleaning during the day when occupants are typically working, has gotten accolades from green advocates for its energy-saving intentions. Whether BSCs are practicing day cleaning or not, they often deal with occupants being in the building while janitors go about their work. Being productive, in some cases, is a challenge. When the process of restroom cleaning is interrupted, workers often have to either step outside of the work area or repeat tasks that have already been completed to avoid getting a complaint. Even using a “Restroom Closed” sign doesn’t prevent building occupants from expecting to use the restroom, Fils-Aime says. Faust agrees, saying he hasn’t found that type of day cleaning to be effective. “I find it very difficult even with closing the restrooms — I put a sign outside and also have a bar across the door, and I still get people trying to come into the restroom,” he says. Another problem Fils-Aime’s female employees have had is accidental or intentional exposure to men in the men’s restrooms — which can cause complaints for both parties. The same can also be true for male janitors who are working in women’s restrooms. Now, whether a worker is male or female, Fils-Aime asks them to leave the area when interrupted. But essentially, BSCs have to deal with occupant interruptions in any work they do, Brooks says.